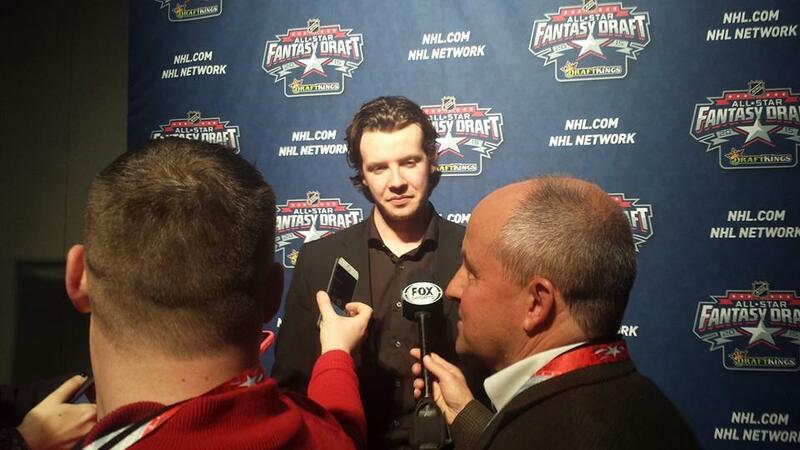 NHL All-Star Fantasy Draft: Are You Not Entertained? Are you still claiming to be bored now? Friday’s NHL All-Star Fantasy Draft in Columbus not only finalized the rosters for Sunday’s contest, but allowed for this year’s representatives to show off a little personality. That’s not a bad thing either for what some now consider a dog and pony show. Lost in the disappointment of injuries or snubs is the entertainment value the NHL All-Star Weekend brings. It’s not only a chance for a city to show off their hometown, while boosting the surrounding economy, it’s an opportunity for fans to see a pool of the league’s best talent all in one setting. Although the All-Star Game itself won’t offer the white-knuckled thrill ride that the Stanley Cup Playoffs present on an annual basis, it’s not designed to be that way. And while MLB has modified their All-Star Game format to award the winner of the Midseason Classic home field advantage in the World Series, it’s a tweak that Foligno and others see as unnecessary for the NHL. “You know what? The game of hockey is a fun sport,” Foligno declared with certainty. “When you start off playing, that’s what it really is. Any kid really wants is to see their favorite player’s having fun… any time they see that, it just makes them enjoy the sport that much more. That’s not to say baseball’s formula isn’t necessarily a failure, despite suffering their fourth consecutive year with viewership under 10,000. With Day Two of this year’s festivities in the books, the NHL All-Star Fantasy Draft alone provided a unique venue for an array of storylines. Right up your alley if you’re into having fun. Call it the luck of the puck. Columbus’ adopted team for the weekend – Team Foligno – secured the NHL All-Star Fantasy Draft’s top pick by winning the official “puck toss.” With that pick, the All-Star captain did what everyone expected him to do by picking Columbus teammate, Ryan Johansen. By taking the league’s ninth-scoring player, Team Foligno solidified that the remaining active Columbus All-Stars would not divide the hosting city. With plenty of worthy talent at his disposal, Foligno stuck to his game plan of looking out for one of his own, much like an older brother including his little sibling in a pickup game of basketball. “Yeah, I mean, I’m not much of a player without Foligno, so it’ll be awesome to have him on our team,” said a humble Johansen. Despite appearing in his third All-Star Game, Toronto Maple Leafs forward Phil Kessel entered 2015’s NHL All-Star Fantasy Draft as the last player to be selected dead last in the league’s last fantasy draft in 2011. This time around, the former U.S. Olympian joined in the laughter after Team Toews followed up the predictable Johansen selection by taking Kessel second overall. There’s just something about the former Boston Bruin that makes him a prime target for NHL All-Star Fantasy Draft history. Kessel would later become part of the first trade in that setting’s history, going to Team Foligno in exchange for Tyler Seguin. While Jakub Voracek (left) and Claude Giroux (right) are teammates in Philadelphia, they’ll be opponents in Sunday’s NHL All-Star Game. Serving as one of Jonathan Toews’ alternate captains, New York Rangers forward Rick Nash knows all too well about Columbus, and vise versa. That’s what made his third-round pick announcement so fitting. With that pick, Team Toews welcomed another former Blue Jacket in Philadelphia Flyers forward Jakub Voracek. While Voracek aligns himself now with Nash on Team Toews, the real stinger (no pun intended) is that the “visiting” team now boasts the league’s top point scorer. It was a scenario that granted Voracek’s current teammate, and Flyers captain, Claude Giroux, with his wish from earlier in the day – although he later denied saying it. 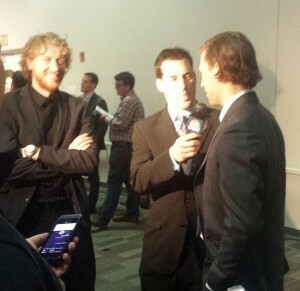 “I, uh.. never said that,” said Giroux as he turned away in laughter. The league’s top scoring combination continued their friendly competitive rivalry with Voracek stating that he has the “better team,” while Giroux took jabs at the 56-point scorer’s defense. “I’m going to be playing hard on him,” added Giroux. Naysayers to the NHL All-Star festivities missed out on perhaps the most entertaining angle in Friday’s lineup with Washington Capitals captain Alex Ovechkin lobbying to be taken last. Earlier in the draft, Ovechkin stated clearly, “I want to go last. I need a car so bad… so bad,” while holding up his now infamous sign. As the night wore on, and Ovechkin remained on the board, NBC’s Pierre McGuire playfully interviewed the Russian Sniper, asking Ovechkin which team he wanted to pick him. “I want to be last,” said Ovechkin without missing a beat. With only three skaters left to be selected, it appeared as though Ovi may have been ready to accept the keys to a new Honda Accord. But when Team Foligno announced his selection, the 29-year-old forward was playfully distraught, initially refusing to get up from his seat. “Everyone says they want the car, but don’t really want the car,” said Team Faligno teammate Steven Stamkos afterwards. Adding insult to injury, both Filip Forsberg and Ryan Nugent-Hopkins received free cars, so in essence, Ovechkin was only one pick shy of getting that luxurious symbol of wealth and excellence. And you thought the All-Star Weekend was going to be a sleeper.